Italian film director, poet, writer, actor and painter Pier Paolo Pasolini (1922-1975) was a highly controversial figure who was at the center of postwar European intellectual life. He was involved in 33 trials relating to scandals, censure and assorted controversies. He was also a defiant homosexual, visionary artist, a Catholic who was tried for insulting the Church, and a non-aligned Leftist. Pasolini was born in Bologna and became a member of the Communist party in 1949, but his political enemies outed him as homosexual, resulting in his being expelled from the party. This ruined his career as a teacher, resulting in a move to Rome, where he wrote poetry and novels of high quality, although laced with obscenity, which brought on subsequent prosecutions. He favored scandal and going against the tide, with a willingness to shock. Beginning in the 1960s he began writing plays while he was dabbling in film-making. It is for his films that he is remembered today. While openly gay from the very start of his career, Pasolini rarely dealt with homosexuality in his movies. One of several exceptions was “Salò” (1975), made the last year of his life. Subtitled “The 120 Days of Sodom,” the film depicted the Marquis de Sade’s compendium of sexual horrors. His personal life, however, was jump started when at age forty he met the great love of his life, fifteen-year-old Ninetto Davoli in 1962. Pasolini cast him in his 1966 film “Uccellacci e uccellini” (The Hawks and the Sparrows). Even though their sexual relations lasted only a few years, Ninetto continued to live with Pasolini and was his constant companion, also appearing in six more of Pasolini’s films. But all of this brilliance, sordidness and controversy was extinguished when Pasolini was just 53 years old. In 1975, in an act of gruesome cruelty, Pasolini was murdered by being run over several times with his own car on the beach at Ostia (the port of Rome). Seventeen-year-old hustler Giuseppi Pelosi, who was later spotted driving Pasolini’s car, was arrested and confessed to the murder. Pasolini’s body was marked by broken bones, crushed testicles and gasoline burns. Twenty-nine years later Pelosi retracted his confession, claiming that three people who denounced Pasolini as a “dirty communist” had committed the murder. 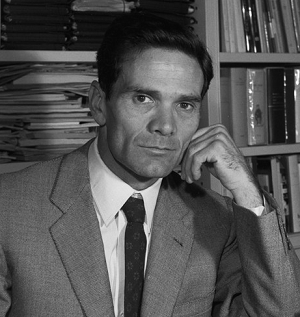 New evidence indicated that Pasolini had been murdered by an extortionist, that several spools of the film Salò had been stolen (the film had not yet been released at the time of the murder), and that an eyewitness had seen a group of men pull Pasolini from his car, but the judges responsible for the investigation found that the new evidence did not justify a continued inquiry – this was Italy, after all! The crime has never been fully resolved. "Pasolini's cinema takes its inspiration from many sources: Renaissance painting, Romanticism, Freudian psychology, Italian neo-realism, ethnographic film-making, and music – his films share an affinity to musical structures and form. His aesthetic often rebuked traditional film grammar, opting instead for a spirit of experimentation. More often than not, he drew upon non-professional actors, casting peasants and urban youths who brought an authenticity and edginess to his narrative films. Behind the camera, Pasolini collaborated with top-notch film-makers, including cinematographers Tonino Delli Colli and Giuseppe Ruzzolini, costume designer Danilo Donati, and composer Ennio Morricone, often working with the crew on location, be it Syria, Yemen, or the impoverished outskirts of Rome. As a poet/film-maker, he spoke of his 'tendency always to see something sacred and mythic and epic in everything – even the most humdrum, simple and banal objects and events.' "